In the Pacific Division, the hits just keep on coming. The top teams are big and physical. If the Sharks had any doubt on what the style of play they can expect to face this season, they can look at their final game of the 2014-15 season. 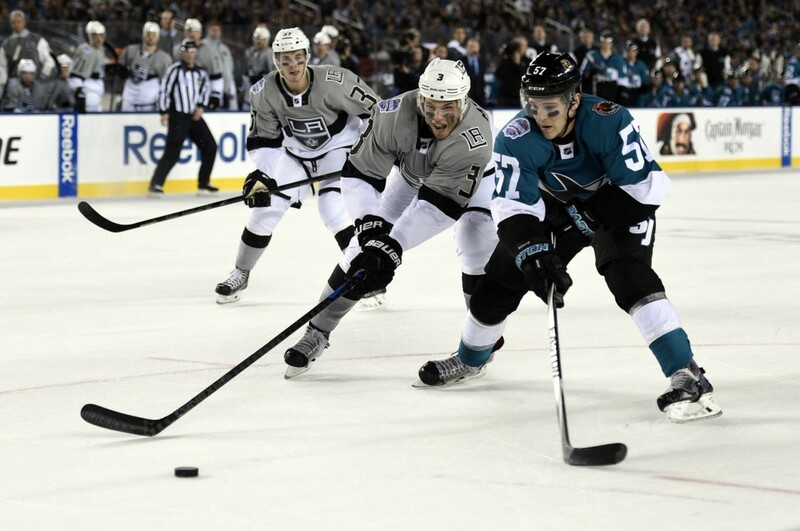 The LA Kings pummeled the Sharks 4-1. 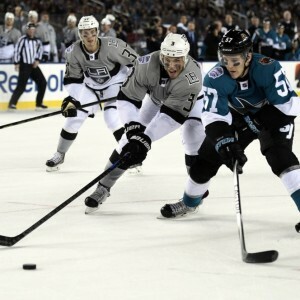 Quantitatively, the Kings outhit the Sharks 31-18. Qualitatively, it looked much worse. The biggest hitting team in last year’s playoffs was likely the Anaheim Ducks, who played ferocious hockey in each of their series. In the seasons prior to this one, the Kings have been among the heaviest hitting teams in the playoffs. In the Pacific Division, puck-possession is the preferred style of play and heavy hitting, especially forechecking, is a major part of an effective puck-possession game. In the Pacific Division, forechecking rules. The Sharks began a trend last offseason that has continued this offseason. The Sharks have made the choice to go smaller and less physical with their forwards. Measuring physical play is difficult. The one statistic that captures it best is the ‘hit’ statistic. That statistic is considered among the most subjective in hockey. In absolute terms, it is difficult to compare across different teams. However, comparisons within a team are probably more valid. It will come as no surprise to Sharks fans that the team’s leading hitter last season was Tommy Wingels with 263, no one else was even close. Second in hits among forwards, however, might very well surprise. 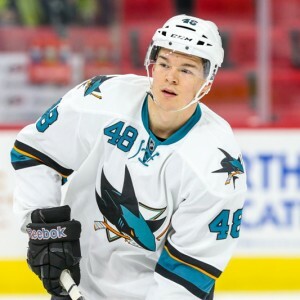 Tomas Hertl, who played all 82 games, finished with 106 hits. 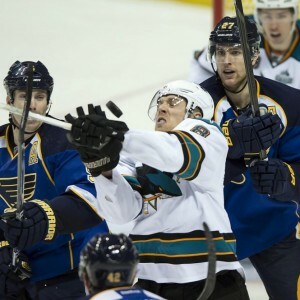 Third on the team among forwards, Joe Pavelski, who also played all 82 games, was credited with 97 hits. The next three spots, 4th-6th, were taken by forwards who have two things in common. Each played less than 60 games for the Sharks and each is no longer with the team. Those players are Andrew Desjardins, John Scott and James Sheppard. Each averaged over 1.5 hits per game. The prior year, Desjardins and Sheppard finished 3rd and 4th among Shark forwards in hits, suggesting their numbers were not flukes. For the Sharks, the 7th and 8th forwards in hit totals in 2014-15 were Logan Couture and Patrick Marleau, averaging about 1 hit per game. As we go further down the roster, we find less physical play from two younger contributors. Chris Tierney and Matt Nieto are expected to handle bigger roles this season. Nieto averaged 1/3 of a hit per game in 72 games, Tierney only about 1/4 per game in 43 games. Joel Ward was brought in, and given his size, one might expect him to be a physical player. Some think of him as similar to Tommy Wingels. That reputation might not be merited at this point in his career. Ward, even while playing all 82 games, was 11th among the Caps forwards in hits — and he wasn’t close to 10th. I contacted THW’s Glynn Cosker, who covers the Caps, to see if that statistic was consistent with his own observations. He indicated that it was. The top Sharks forwards in ice time last season were Patrick Marleau, Joe Thornton, Joe Pavelski and Logan Couture. It is unlikely that any of these players will be more physical next season. The 5’11” Pavelski has always played physically above his weight and size, it would be hard to expect more from a player who consistently gives it everything he has. Marleau and Thornton are both 36 this season, neither is going to be more physical at this point in their careers. Another aspect of this, the Sharks took their second biggest hitting forward in 2013-14, Brent Burns, and moved him from forward to defense last season. Among the Sharks biggest players, Burns is perhaps the team’s heaviest hitter. Burns had 145 hits as a forward in 2013-14. As a defenseman in 2014-15, he played 70% more minutes, yet finished with a nearly identical hit total, 148. To put that in perspective, his two linemates from his time at forward, Pavelski and Thornton, combined for just 136 hits this past season. The Sharks made two major skating acquisitions this offseason, the aforementioned Ward and defenseman Paul Martin. Martin finished 6th in among the Penguins defensemen in hits. I’m less concerned about hits by defensemen (unless you can thump people like Douglas Murray). Responsible positioning is far more critical than hit totals for defensemen. Still, Martin is replacing Matt Irwin, who finished fourth on the Sharks in hits among defensemen despite playing only 53 games. The Sharks have downsized their forwards. Players like Tierney, Nieto, Ben Smith (who does play physical hockey) and Melker Karlsson are smaller than the guys who the Sharks moved (Desjardins, Sheppard, Tye McGinn). Even the enforcer has shrunk, with Mike Brown, injured most of last year, taking that role from the massive John Scott. Frazer McLaren may also play some for San Jose this year in a similar role to Scott. Come opening night, the likely line-up may have only six of 12 forwards over 6’0″. Barclay Goodrow, Couture, Hertl, Marleau, Thornton and Ward. As already discussed, the latter three in that group are not expected to be overly physical, even with their size. In comparison, the Kings are likely to roll out 11 of 12 forwards at 6’1″ or larger. Five of the Kings forwards are 6’3″ or larger, only Thornton is taller than 6’2″ among Sharks forwards. Meanwhile, the Ducks can be expected roll out eight forwards 6’2″ or larger. While I’m loathe to compare hit totals among different teams due to the problematic nature of the stat, I’ll note that eight Duck forwards were credited with 100 or more hits last year, seven King forwards were credited with over 100 hits and just two Sharks forwards. Judging from what I saw on the ice, these numbers make sense. In the ten games the Sharks played against LA and Anaheim last season, the Sharks managed to have more hits only one time. 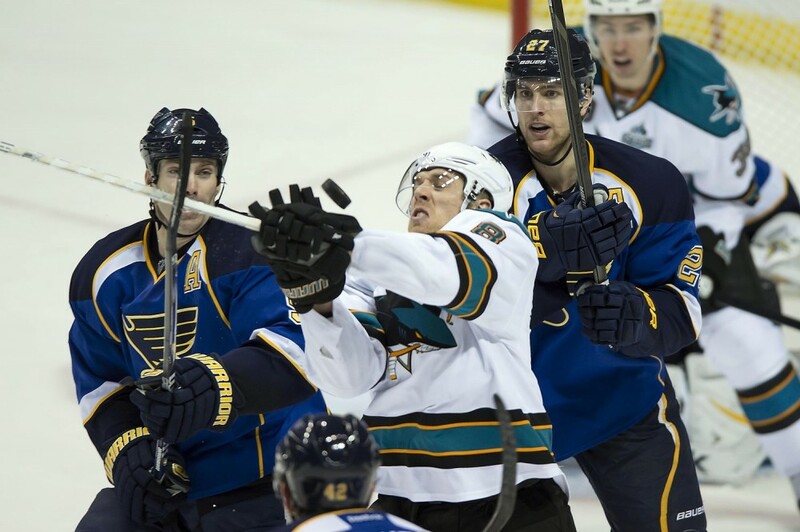 Over those ten games, the Sharks had 71 fewer total hits than their opponents. Even among the Sharks prospects, one finds mostly smaller forwards. 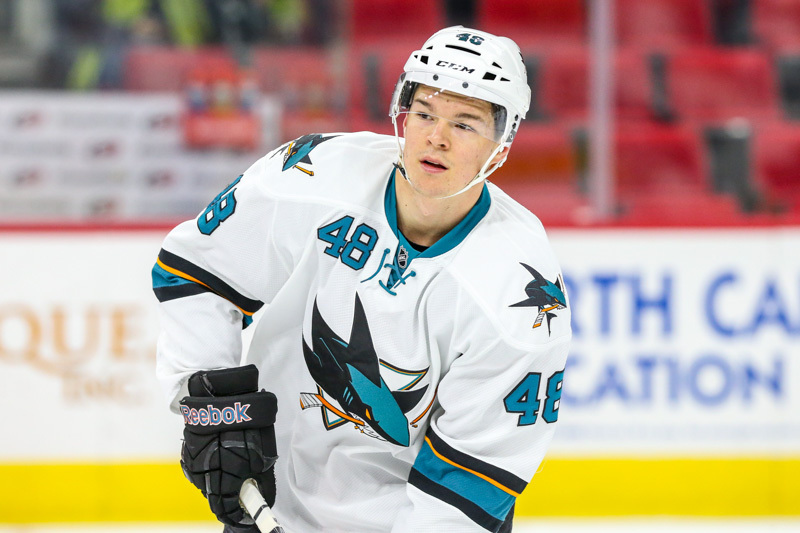 At 6’1″, Nikita Jevpalovs and Timo Meier are the biggest forwards with a chance to make the team in the near future. One larger forward, Eriah Hayes (6’4″), was not retained by the Sharks for this season. There is an opportunity open for Goodrow. He had a respectable rookie season, but he could use something to help him become a regular in the line-up. 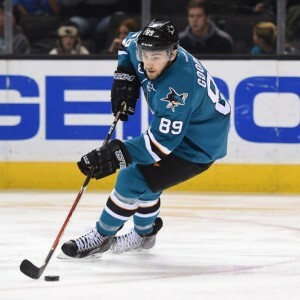 With the shortage of forwards on the Sharks roster who are both big and physical, Goodrow might find himself a useful niche if he increases his physical presence. Joonas Donskoi appears to have a good shot at making the roster and Goodrow could be the player that loses out in that scenario. Donskoi is listed at 2″ shorter and 35lbs lighter than Goodrow. 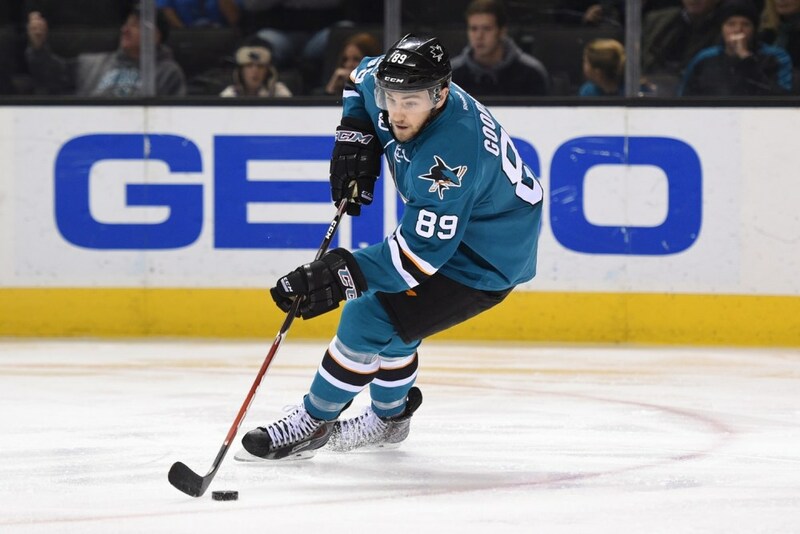 Should Goodrow fail to make the opening night line-up, its possible the Sharks will only ice five forwards over 6’0″. One other player needs mentioning: Raffi Torres. The physical forward, soon to be 34, is coming off a multi-year effort to recover from a pair of knee surgeries, the most recent happening in February. Can Torres be an effective player again? If so, when? Neither answer is clear. If he returns to form at some point this season, he can be a needed physical force. Size and physicality are only loosely correlated. The Sharks most physical everyday forwards project to be Ben Smith and Tommy Wingels. Smith is 5’11” and Wingels is 6’0″. Torres, should he successfully complete his recovery, projects to an everyday role, He is also 6’0″. Still, bigger often mean heavier hits. Importantly, bigger players have an advantage in absorbing hits. The Sharks can expect to be on the receiving end of plenty of hits. If there is good news in this, hitting does not always correlate with success. Neither of this past season’s Stanley Cup finalists were big hitting teams. But the Kings, winners of the Cup in two of the last four years, certainly were. The Sharks, by icing a smaller team, may have a formula that will challenge opponents. Will smaller equate to agile, slippery and elusive? The lines being forecast by various prognosticators have the Sharks with only one forward over 6’0″ on the bottom two lines. If it works, the Sharks may force changes to the style of play that the top teams in the Pacific have used over the past several seasons. For the Sharks, entering the season undersized and less physical up front carries considerable risk. Taken in total, Sharks forwards have gotten smaller and less physical than they were in the 2014-15 season, and quite a bit less physical than they were in 2013-14. This points to a less physical Sharks forecheck going into this season. And in a division where the forecheck rules and puck-possession hockey is pretty much the mantra of all the top teams, this is an area of concern. Or opportunity.